I recently visited the National Museum of Nuclear Science and History – or, as I knew it growing up in Albuquerque, the Atomic Museum. The museum has a brand new full size building, with enough room to display most of their catalog for the first time, but not quite enough money to do so professionally. The result is a brief, magic window in which rare artifacts are finally out on display, but you can touch them and bang on them and crawl around in them. Many of the larger items, including a disassembled B-52 bomber and many rocket engines, are simply dumped in rows in a dirt courtyard in back. Somehow, I expected that I would traipse through the museum, looking at old photographs and brushing up on my nuclear weapons trivia, with perhaps some solemn moments of reflection in front of the reproductions of Fat Man and Little Boy. Instead, I found myself oscillating between uncontrollable sobbing and open-mouthed technological awe. It went something like this: “Wow, a cyclotron! Holy crap, the Potsdam declaration. (Muffled sob.) A real nose-cone from an ICBM, cool! Whoa, photos of ground zero at Hiroshima. (Fountain of tears. )” I went back the next day to take some original photographs with the intention of writing a thoughtful, well-researched article on my personal experience. Unfortunately, I have discovered that I seem to know almost nothing about the history of nuclear arms testing and development – and this is from someone whose parents worked on the Strategic Defense Initiative (Reagan’s “Star Wars”), who read Richard Rhodes’ “The Making of the Atomic Bomb” AND “The Making of the Hydrogen Bomb”, who grew up in New Mexico, home of the Manhattan Project. More accurately, I knew some of the relevant facts, but in a vague sort of manner devoid of any connection with everyday life. They were numbers of megatons in a reference book, fictional movie plots involving lost nuclear weapons, and contrived acronyms for arms reduction treaties. But walking through the museum, I saw brass Nazi goggles and notebooks, the car that carried the Trinity bomb to the test site, a copy of the Potsdam Declaration, movies of ordinary Japanese citizens clearing rubble with hand baskets in Hiroshima and Nagasaki, and the dented shells of nuclear missiles that were, for reals, lost in a midair collision over Spain and recovered after a multi-million dollar search. (Far more were lost and never found, in or over the ocean.) I saw, and touched, and yet still almost could not believe in, the outer shell of a “Davy Crockett” miniature tactical nuke – a literal “backpack nuke,” small enough that I could encircle it in my arms. I thought backpack nukes were only a theoretical possibility, and yet they were manufactured, assembly line style. I was particularly struck by how heavily the shoulder straps of the backpack were padded – a consideration so practical and down-to-earth in the face of the incomprehensible horror of the weapon itself. And then I really got myself in trouble: I bought a copy of Michael Light’s 100 Suns from the book shop. It is a collection of 100 photographs of nuclear explosions from the U.S. nuclear testing program, during the time when nuclear tests were conducted above ground. 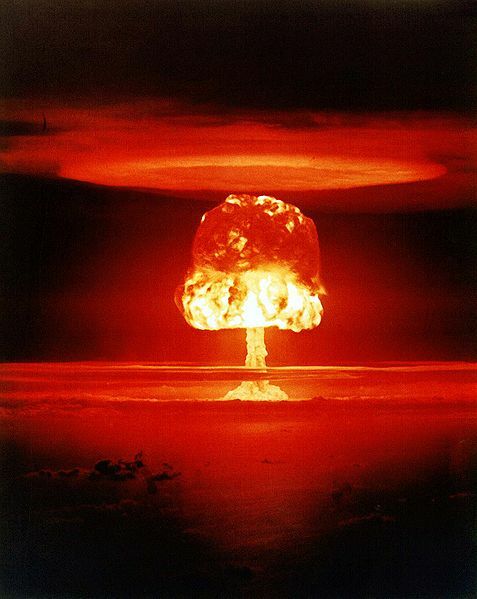 I knew, intellectually, that Enewetak and Bikini Atolls had been practically obliterated by thermonuclear bomb tests, but seeing a 20″x26″ color photograph of the fireball of a 11 megaton explosion is… entirely different. And entirely different than seeing it on the computer screen – the image below has nothing like the power of that in the book. Each photograph in this book symbolizes and encapsulates the conflicting and overpowering feelings I had in the museum: awe, excitement, and deep grief. My favorite photos are ones of the people watching the tests – most of them are bored, or matter-of-fact, but a few of the faces show the same awe and awareness that I feel when I look at the photos of the explosions, decades after the fact. The photos are accompanied by short footnotes at the end of the book, describing the technical and political circumstances and fallout (literal and figurative) of each test. And here, yet again, I learned how little I knew: that several of the thermonuclear bombs accidentally exceeded expected yield by several megatons and accidentally sickened people (How!? can something as complex as a thermonuclear bomb go wrong – and result in even greater power?? That’s not how computers work! ), that we actually exploded nuclear weapons above the atmosphere and were surprised by the resultant EMP (I thought physicists predicted it, not that we knocked out Hawaii’s power grid by accident and worked backwards from there), that the largest nuclear explosion ever was a 50-megaton test by the Soviets in the Arctic (“test” – it was entirely for political effect), that we exploded thermonuclear bombs in the continental U.S., that U.S. soldiers were put in trenches close to bomb tests in Nevada so that they could conduct maneuvers within a few hundred feet of the smoking, radioactive craters immediately afterwards. It never even occurred to me that thousands (hundreds of thousands?) of people had witnessed nuclear tests and that I could go talk to one of these people and ask them what it was like. And I never would have guessed that I would be jealous of them, because more than likely, no human will ever witness a nuclear explosion first-hand ever again. I don’t know what to do now. Maybe most people already know these things, in which case it will be difficult to communicate my awe. Maybe they don’t know these things, but I won’t be able to cross the boundary between intellectual knowledge, like what I knew before I went to the museum, and the intense visceral awareness that the physical objects and photos gave me. Maybe I can’t do better than Michael Light’s magnificent book and I should just write him a positive Amazon review. Maybe I can do better, if I use all the resources available to me on this here World Wide Web. Which of the above facts surprised you? What is the most shocking thing you know about nuclear weapons and the Cold War? Do you know anyone who saw a nuclear explosion in real life? Have you asked them about it? Are they willing to talk about it? What is the movie/book/web site/whatever about nuclear weapons that you would recommend the most? Any advice for me on what (if anything) to do with this project? Thank you for reading all the way through this. I knew about all the things you listed. I think I was surprised when I learned how Teller-Ulam bombs worked (and how big the first ones were). Klaus Fuchs was interesting, especially compared to the Rosenbergs in crime and punishment. Similarly, Mordechai Vanunu is an interesting tale. So I guess I go more for stories about the humans involved these days. I think I knew the facts you listed, and don’t think I know anyone who’s seen a nuclear detonation. Perhaps the most shocking thing about these weapons is how matter-of-fact our generation seems to be about them; we generally don’t think about the import of maintaining such a horrifying arsenal as “deterrent”. A couple of years ago I had a chance to explore the Scottish secret bunker with some British acquaintances who are a generation older; they talked about the fatalism that comes with growing up in the shadow of nuclear war when almost all of your population is within 15 miles of a primary target. I knew quite a few of those facts from there. Let us hope, pray for those that have prayers that nobody ever sees a nuclear explosion ever again. _Surely You’re Joking Mr Feynman_ – Richard Feynman Section entitled Los Alamos From Below. Which is mostly humorous recollections of the project, its “success” then his subsequent breakdown when he realised the implications of not stopping when the Nazi threat was over, given this was the original reason for making the bomb. I’m sure you’ve read it, if you haven’t it’s a must read even if you avoid all of the Los Alamos section. It’s entertainment. Funny as the day is long. The Cold War could start again (or something even worse) at a moment’s notice. The terror we grew up with is not gone or anything like gone. Oh yeah and SDI was a total crock, scared me silly. It was not possible to prevent nuclear attack, so was technically useless, but it made the opposition nervous about war being more likely. Not at all good. Mercifully the worst didn’t happen as a result. The only thing I didn’t know was that there was surprise at the EMP. I’d assumed that was expected. “Edge of darkness” was an interesting cold war nuclear thriller shown on British TV in the ’80s. It doesn’t go into the technology itself much, but there’s a lot of nuclear politics. It’s available on DVD. Apparently there’s a remake with Mel Gibson due out next year. I shudder at the thought. I don’t know anyone who has seen a nuclear explosion. I come more from the kind of background where I can find you a lot of people who’ve seen unusual things in livestock (as do you in a way) than have been present for major events. Most of what I know comes from either Richard Feynman’s memoirs or South Pacific stuff. The sinking of the Rainbow Warrior by French agents (‘Opération Satanique’ apparently). I remember the wave of anti-French protests and sentiment in Australia around 1995 when the moratorium on testing at Mururoa was lifted. I know that the safety of the land around Maralinga in South Australia is constantly discussed, particularly with reference to the traditional owners, but don’t know a lot of the story. I don’t know if there is a good reference work on British or French testing, but it would probably be a worthwhile inclusion in the project: it’s more interesting to me personally (obvious geographic bias) that the British tested in Australia and that the French killed a protester in New Zealand than that the US tested on within its own borders. Oppenheimer’s reactions to Trinity are interesting to read (as are the second-hand accounts of them). I tend to be most surprised by the ‘unintended consequences’ things. The EMP? Wow. I think you’re fairly safe on the question of most people knowing about these things, obviously as long as you don’t really mean “US 20th century military or science history geeks” when you say “most people”. Sure, readers of your journal might. But my mother and I have been reading military and science history for years and I can’t imagine she’s better versed in nuclear testing than I am. So you’ve got lots of scope. I’m sure conveying awe is possible, if perhaps not of the same type that one hundred explosion photos creates. I was thinking about this over dinner and I suspect it would be a question of what point of view you write from. I have not got a good opinion of what might work there. I don’t think self-insertion of the style people use when they get some money to spin their New Yorker pieces out into books (the story of how I, Valerie Aurora, learned more about nuclear testing, in chronological order) is right, but the individual perspective is important. I thought of a possible science writing project for myself the other day, but unfortunately it wouldn’t have such a potentially cool writing process. If you want a sounding board let me know. But there’s also a significant impact of nuclear weapons outside the US sphere. I’m thinking particularly of the British nuclear testing at Maralinga, South Australia. As for movies/books, it’s far more contextual as to the military-industrial complex, but Why We Fight is one of my favorite documentaries around this subject, and somewhat tangentially, The Fog of War. My father-in-law was one of the soldiers present at a test on US soil and asked to perform excercises in the aftermath. Later he was a guard at Groom Lake (Area 51). He has plenty of life insurance. I think I’ve learned most of this stuff over the years, save the EMP results. But I’ve talked to a few people about this topic and I think I had a weird take on it. From a very young age, nuclear weapons have always scared the crap out of me. They were the End Of The World, a button-push away by some crazy American or Soviet politician. It was particularly galling that, being Canadian, we had no input in the matter either way. We were just parked inbetween the US and USSR by accident, on the missile path for both of them. Likely cross-fire victims. We got to house the DEW line so we could know a few minutes beforehand when the world was going to end. Nice booby prize. For many years I went to sleep convinced that a neighboring country might well destroy the world before I woke up. That “if I die before I wake…” prayer always seemed quite tangible. The cold war ending was one of the biggest sighs-of-relief I ever felt. Learning Real Facts about nuclear weapons as I’ve grown older, the difficult part has been learning to take them less seriously. New facts put them in context, as something a nation might develop in any state other than that of a suicide cult. It’s been hard to believe that, for example, they have a quantifiable, limited per-weapon yield — even Tsar Bomba! — or that fallout is largely heavy and sinks. When I was a kid they were just The Instant And Awful End Of The World. I had a much more stoic reaction to visiting that museum (before their new building) and visiting Los Alamos, but the feelings you describe are absolutely the heart of it. Richard Rhodes’ books are the best I’ve read on the technical subject, but on the human side, the best I’ve read is Sadako and the Thousand Paper Cranes. Sort of the Diary of Anne Franke of the Hiroshima bombing. There’s also the Anime film Grave of the Fireflies, though that deals with conditions in wartime Japan in general. I do wish I was as confident as you that no human will witness another nuclear explosion, but life is long, and there are many lands and many hands holding these things. My parents are chemists and my father took a course taught by Kistiakowsky in college. So they had an interest in the history of atomic weaponry and bought all of Richard Rhodes books on the subject. They also didn’t believe in hiding those books away from children, so at the age of 8, I innocently picked up The Making of the Atomic Bomb and flipped through it till I came across the picture section. The photographs of the melted bodies of Hiroshima made my heart stop and I think a part of me has been haunted by them ever since. I haven’t ever completely read any of his books, but I’ve skimmed through them so many times over the years. I was also obsessed with the film The Atomic Cafe. Yeah, I was a rather morbid kid. But because of that film, I knew about the soldier guinea-pigs marching towards the mushroom cloud. (I didn’t know about the EMP disruption, though.) Needless to say, I insisted on visiting Hiroshima when we were in Japan last year. “Intense visceral awareness” from the objects… oh yeah. Joe and I read Survival City earlier this year. It’s about the remaining structures associated with the nuclear arms build-up and is a good reminder of how obsessed America was and how much it’s still a fact of life, albeit much more in the shadows these days. Ooh, can I borrow Survival City? Which fact surprised me? I guess that the first EMP effect actually knocked out power in Hawaii. Do I know anyone who saw a nuclear explosion in real life? No. Movie that I would recommend the most? “The Day After,” simply because it was the first time someone ever had the gall to show what a real nuclear war would be like. Along with changing American’s perceptions of nuclear war, it also changed Reagan’s mind about tactical nuclear war, and helped lead to actual arms reductions treaties with the Soviet Union. Photos from RVSN museum at Pervomaysk, Ukraine. and mechanics capable to open it in 7 seconds or detonate away if said mechanics became damaged and couldn’t open via normal means. to order second strike survived. all political and economical clusterfsck in Russia after USSR decay. Wow, that is amazing! Thank you so much for the pointer. The Nuclear Sciences Museum looks amazingly similar to the RVSN museum – except New Mexico doesn’t get enough rain to grow grass around the abandoned missles. I can try to translate text if you want. I would appreciate that – I sent some of it through Babelfish but didn’t understand much. Children of the Dust by Louise Lawrence. Also ++ on Sadako and the 1000 paper cranes. I really believed there was a good chance I had no future, and I was utterly powerless to prevent nuclear war. This was something that would be determined by bigger nations than mine, and if we weren’t directly hit due to our secret US comms bases, we would die a horrible death from nuclear fall out. Didn’t happen. But everytime there’s posturing about nuclear weapons, a little part of me thinks “here we go again”. The fact these weapons are still being made AT ALL by ANYONE is still a powerfully depressing thought. Translation isn’t exact of course. I don’t know accurate translation of some words. [RVSN is transliteration of shortcut not shortcut itself. an tower equipped with minigun, infrared detectors and remote control. and 15 USD for foreigners. Russia citizens are counted as locals which is good. Museum can be divided in 3 parts. First, exposition inside Officers’ House. History of unit, dismantled control panels, radios, photos, schemes, charts etc. with possibility to explore internal and external structure. maintaince and for some reason ZIS-3 cannon. One can touch anything and study. And finally, silo itself with infrastructure. Khmel’nickii, Kolomii, Kotovsk. Command Center was at Vinnica. Silos At Belarus also shown: Postavy, Lida, Mozyr’. with highboiled [sorry, –adobriyan] components and autonomous control system. Carribean crisis happened exactly because of R-12. Need to point out that exactly this rocket unit didn’t have Satan. There were solid-propellant RS-22 (SS-24 –adboriyan) here. But not for long. RS-22 was accepted by Ministry of Defense in the end of 1989.
however, its modifications are in armoury still. (very tight), radio transmitters, batteries, life support system for 20 days. (automatical system for ordering second strike). silo, after that cover was sealed. Do not open if DG 1,2 are opened. Elevator moved down to where lauch command could be actually ordered. One can buy a badge of RVSN of Ukraine (!) and DVD(?) with video of launches. Those who live in Pervomaysk probably aren’t aware of such museum near them. Learning Real Facts about nuclear weapons as I’ve grown older, the difficult part has been learning to take them less seriously. This was my experience as well, though I was closer to it. (Dad worked for the US military, and we were right next to Washington DC for most of the Cold War.) So any mention of the subject provoked fascination and horror of exactly how that hot dog stand in the middle of the Pentagon was going to go down, and studying the weather patterns of the day so that we could determine whether our likely lifespan would be measured in seconds or days. It was all entirely out of my control, but somehow I was subsumed in the “we” of one of the sides by sheer virtue of geography. Thanks for the time and care it took to write this. It was very interesting. It’s funny– I don’t think I knew enough to be surprised, but I was fascinated nonetheless. And recently watched two films about the survivors’ experiences of hiroshima (“After Hiroshima Mon Amour” is one and I can’t remember the other title — it was part of a lecture). What definitely didn’t surprise me was the part where they didn’t predict EMP until it knocked out the grid and that the bomb gave too much power. Science *often* works by working backwards from unexpected side effects or something engineers get working (like steel alloys) before science can explain why. Computer Science is odd in this respect because computers are fragile so comp engineering is all about precision and if precise assumptions about its mechanisms are not maintained, it breaks, seg faults, or aborts. :) Chemicals don’t seem to work so much like that. The unpredicted EMP surprised me because so much of nuclear weapons making is planning and predicting and modeling in advance. Most nuclear weapons work the first try. The first nuclear fission reactor worked first time as well, with only slight miscalculations on the dimensions of the pile. Usually, science and engineering are full of surprises and accidents, but not when they involve weapons or space flight. Yeah, i guess for weapons that are dropped and decimate, like nuclear bombs, the mechanism seems like it has a large margin of error. Decimation can happen in many ways and too much power still sorta accomplishes the death and awe. But for planes and targeting incidents, it is surprising. I wonder, though, to what extent that is an artifact of how the histories of these things are written. I wonder what counts as “the first time” you try something — does that exclude all the smaller scale experiments that led up to it? Thank you for the translation! I didn’t know about Satan and the automated second strike. Crazy. Here’s a NYT piece on the evolution of Obama’s agenda to eliminate the global nuclear arsenal. I had a similar museum experience last week when I visited the Bradbury Science Museum at Los Alamos, NM. If you get a chance to visit the Bradbury, take it. Although it is a fairly small museum, it has many excellent, exhibits that showcase the past and present work at Los Alamos. Like I said, it is physically small, but it is packed with lots of great things to see and do. I grew up in the 50’s and 60’s under the constant Cold War threat of instant nuclear annihilation. At school, in addition to regular fire drills we had nuclear attack drill where you either hid under your desk or went out in the hall, sat down on the floor with your back against the wall, put your head between your knees and your arms over your neck. It was scary. I either outgrew my childhood fears or developed a love / hate relationship with nuclear power as my first two college degrees were in Nuclear Engineering, however I have never practiced that discipline. I have always been a real nuclear history buff. At the Bradbury, I was surprised by the large number of kids that seemed truly interested in Fat Man, Little Boy and their descendants. The one thought that I could not get out of my head is that these kids did not have to grow up with the same fears of these terrible devices that I did. That made me happy. I recommend two fairly recent biographies,Einstein : His Life and Universe by Walter Isaacson and American Prometheus : The Triumph and Tragedy of J. Robert Oppenheimer by Kai Bird, Martin J. Sherwin. My favorite Cold War movie is Fail-Safe, but Dr. Strangelove gets my vote for best Cold War dark comedy. May be you’ll find shocking that the most powerful bomb was exploded by USSR in 1961. It was 50 megatons. Its shock wave travelled around the Earth 3 (three!) times. The test took place in the Novaya Zemlya archipelago. Before the test it was planned to make 100 megatons bomb, but according to Khrushchev it was decided to make 50 to not damage windows in Moscow (which is several thousand kilometers from Novaya Zemlya). > What is the most shocking thing you know about nuclear weapons and the Cold War? That at the time of Cuban missile crisis one Russian sub was cornered by US Navy, depth charges were dropped on it (allegedly, to harass it, not destroy), and as we now know, they had a nuclear-tipped torpedo and had permission to use it if sub would be damaged! We were this >< close to a nuclear war. That Tsar Bomb, even though did not kill a single human, did kill and incapacitated a lot of animals. The 57 MT blast has HUGE flash radius. Eyewitnesses say that a lot of sea gulls and other birds were blinded. These blind birds were flying haphazardly, like bats, and were dying from starvation. Polar bears were similarly affected by the flash, and also by radiation in their food chain (fish). It references Lake Karachay (http://en.wikipedia.org/wiki/Lake_Karachay) in western Russia that’s so polluted with nuclear waste from weapons manufacturing, that standing next to it for one hour would give you enough of a dose of radiation to kill you within two weeks. I wish that were so, but I fear it isn’t. Either they will be used against us via a “rogue” nation, or someday we will have to use them defensively. Of course my saying so doesn’t make it so, but still it is so. The world is a cruel, harsh, animalistic place. We like to think we are beyond that, but we aren’t. I also spent much of my childhood both terrified and mesmerised by nuclear weapons. That’s never really gone away, either. It all started with an English lesson when I was about 9 years old, at boarding school, and the teacher assured us very confidently that there would be a nuclear war at some point in the next ten years. Thankfully, events have proved him wrong, but what a way to terrify a bunch of 9 year old kids! Anyway, an interesting little book I picked up once is “Megaton mornings”; a memoir of a British man doing his national service in the RAF, who in about 1962 was posted to Christmas Island, and witnessed a couple of dozen American thermonuclear tests. The memoir is quite interesting in its descriptions of the reactions of other servicemen, ranging from the blasé sleeping through the tests (!) to grown men cowering under tables, unable to control their fear, even though they were at a safe distance, upwind, and knew it. I don’t suppose anyone knows where they’d be on that scale without being there. It’s not the world’s most literary read, but was nevertheless an unusual perspective. I think it’s quite a hard book to find though, I think it’s out of print now, and I don’t know where my copy is. If you’re really keen on trying to get your head around what nuclear weapons mean then I’d advise visiting Hiroshima. I had the opportunity to visit a few years ago, and am very glad I did. I won’t describe it as pleasant (although the modern day city of Hiroshima is a lovely place and had I not been there to visit the memorials and museums it would have been a very pleasant weekend), parts of it were frankly harrowing, but I felt it gave me a new perspective on the nature of warfare and the use of nuclear weapons. Bizaarly it was a number of the smaller things that stayed with me, the sign, maybe 5 minutes walk from the center of the explosion marking the edge of the fireball; the wall covered with copies of telegrams of protest from the major of Hiroshima to various world leaders, one letter for every weapon test; ceramic roofing tiles blistered and distorted from the heat of the blast and the section of steps with a human shadow burnt into them, with the accompanying addition to the description text that relatively recently a visitor to the museum had identified the shadow as probably belonging to their mother who had worked nearby and just to stop and sit there.